how can I compile the part of PRO ATC X, regarding the data of the airplane, to make it as equal as possible to your A20-321 pro? Not sure what you mean with "compile". But reagrding Pro ATC X you better contact the dev of this product directly, as it isnt an Aerosoft product. I know it is not your product, but in this screen above you enter data relating to the flight model you are using. I would like to be able to enter the required flight data, as you have set up in your flight model A32'-321 pro. I understand, but there is no "one set" of data, as all what you see in the dialog box depends any man variables. So there is not one fixed climb/descent rate; same for V-Speeds, and Max FL410 is also more a theoretical value. You could set these types of programs up with "average" values. I say that because Otto is right that your V-speeds and climb etc. will not always be the same for every flight. So for example, in LittleNavMap I have some values for the buses but they are generic/average/typical climb/descent rates...so in my opin you can set your Pro Atc X up the same way. 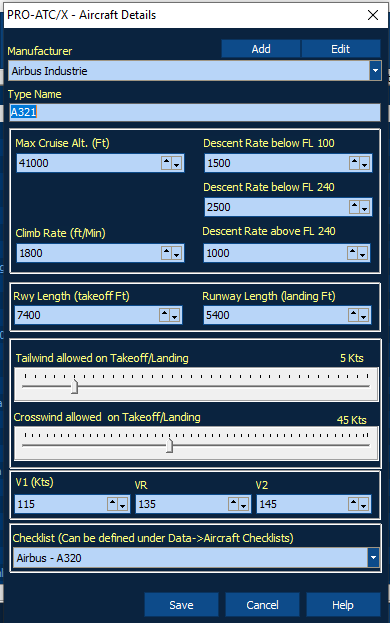 Frederic's suggestion above is good, as your descent above FL240 should be higher than the 1000 you have in your Pro ATC X screenshot. 3500 as Frederic suggests is closer to what I would use. I think I use something like 3000 for my DC-10 and it seems to work well most of the time. These programs are not perfect, you as the pilot have to be ready to intervene with your vertical speed at a moments notice. Title edited to show "Data" instead of "Date".